> MISSED THE EVENT? PURCHASE THE PRESENTATIONS AND AUDIO HERE! Uniquely, Printed Electronics USA 2005 will cover the full breadth of applications and components - from organic semiconductors and inorganic printed semiconductors, to displays, sensors, power and sound. Materials and manufacturing techniques are also covered. Speakers will cover the applications of this electronics "toolkit", the biggest potential often being to create new markets. Last year, the event was attended by over 175 delegates from 18 countries in the US in December and by 180 delegates at the European event in April. There will be several exclusive announcements and an exhibition. Printed & disposable electronics: Why, when & who? The market for organic and printable electronics is expected to reach $300Bn in 2025 - almost twice the size of the silicon industry today. The future electronic fabrication plants will be printing presses. Enormous markets will be created where conventional silicon chips cannot go today because they are too costly, large and brittle. A full range of electrical and electronic components will be printed - from transistor circuits to display, power and even speakers. This conference uniquely covers the full range of this "new electronic toolkit", their development, what is needed and their application - today and in the future. 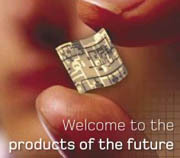 IDTechEx provides independent consultancy and research on printed and flexible electronics. Today, not all of this is printed, but we and others see this as the end game for the technology. We have devised this programme bringing together significant parts of the value chain. The advent of low-cost disposable technologies provides opportunities to develop products that will change our lives, not simply adding novelty features, but improving the user interface to provide products that are more intuitive, safer and fun to use. Early case studies are covered, as are potential markets and needs by potential users. Applications covered include electronic smart packaging, such as the changing use by date on packaging, sensors on drugs and foods, brand enhancements, signage and large area displays, photovoltaics, RFID, merchandising, healthcare applications etc. Global companies will discuss their technical developments and progress, some with first announcements. Whether it's flexible displays, electronic inks, organic electronics, low-cost laminar batteries, sensors, or circuits - over the course of our conference we will update you on the current status of the fast-moving world of printed electronic technologies, and explore future applications. Our conference presenters are at the forefront of technology development, as well end-user brand owners - companies looking to enhance and protect their brands in future. Click here to register. For further information and exhibition opportunities contact Chris Clare c.clare@idtechex.com or call + 44 (0) 1223 813703. Copyright © 2019 IDTechEx Ltd | Email: c.clare@idtechex.com.